Turkey is synonymous with fall. The air turns crisp, and the ovens turn on! Depending on how you cook your own turkey, the feast that accompanies it may not be good for your dog. Now, don't get me wrong, plain, lean, cooked turkey is just fine for your dog. It's the gravy (usually with spices and onions), the mashed potatoes (loaded with butter and gravy), and the pumpkin pie (loaded with sugar), these are the things your dog should not feast upon. You may remember that last months Newsletter was all about pumpkins. However, I was saving one special recipe just for November. 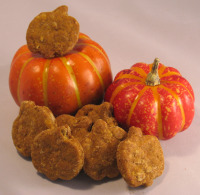 You can't have a turkey feast without a pumpkin pie, so this month we've made pumpkin pie dog biscuits! 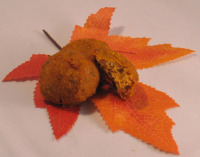 Turkey & Stuffing Dog Treats - We've combined two favorites into one treat, turkey and stuffing. 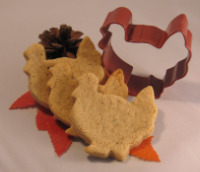 This is an easy dog treat recipe since you use turkey baby food straight from the jar. This is a wonderfully textured treat. The outside becomes crisp, but the inside stays nice and moist. Wheat Free Dog Treats with Turkey - If your dog is sensitive to wheat, you'll want to make a batch of these versatile treats. Not only can you use canned turkey, but you can mix it up with canned tuna, chicken, even luxurious wild salmon. November is Pet Cancer Awareness Month. To learn more about what is being done in this field of study, or how you can support these organizations, please see the resources below. By supporting these causes, you are helping to save or extend a companion animals life. You are also helping researchers come closer to cures for both animals and humans diagnosed with cancer. November is National Peanut Butter Lovers Month. Even though the holiday is for two-legged peanut butter lovers, your four-legged family members will appreciate a homemade dog treat or two. Check out our current list of Peanut Butter Dog Treat Recipes to get you started in this month long celebration of everything peanut butter. "Just wanted to say thanks for a great website. It is my go-to site for answers and great recipes. I've also passed it along to others who need education about care and feeding of dogs." What are your thoughts? Don't keep them to yourself, Contact Us and let us know what you like, or even dislike, about Dog Treat Kitchen.com. The more you share, the more we can help all dog treat bakers, and their dogs. We're going to give you in depth tips, strategies, and materials to ship your homemade dog treats to your friends and family. Winter is such a wonderful time for baking. So we think you should share the love of homemade dog treats to a deserving dog. We're always looking for ways to say Thank You to our loyal newsletter subscribers. That's why we've gathered the top recipes for you in a free e-Book. Please accept this special gift, a collection of the Top Ten Favorite Dog Treat Recipes. Right-click to download this PDF file. You will need Adobe Reader (the latest version is recommended) installed on your computer in order to open and read this e-Book. You can get Adobe Reader here (a new window will open so you can download it without leaving this page). If you need assistance or have questions regarding how to receive your gift, please use our Contact Us form, and we will be happy to help you.